Japanese Fermented FoodsFermented foods are made by taking advantage of the workings of microorganisms and enzymes in food ingredients. The Japanese have a long history of making fermented foods a close part of everyday life. 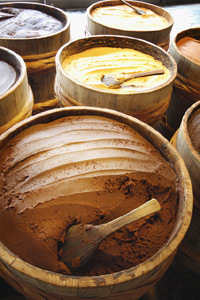 In fact, these foods are an essential part of the daily diet in Japan. Two essential condiments, for example, are miso (fermented soybean paste) and soy sauce, both of which are made from soybeans. Similarly, natto is made of fermented soybeans and eaten with warm rice as a standard breakfast food. As a side dish, tsukemono (Japanese pickles) is made by fermenting vegetables in nuka, or rice bran, and as a snack to go with alcohol, shiokara is a delicacy of fermented seafood with fish entrails. One of the reasons why Japan has so many fermented foods is that the country's temperature and humidity levels are conducive to the reproduction of bacteria and other microorganisms that stimulate fermentation. Mold such as aspergillus is used for fermentation, as is yeast fungus, lactic acid bacteria, natto bacillus and other fungi. Through the workings of these kinds of fermentation bacteria, a savory taste is produced and extracted, making it possible to produce healthy, nutrient-rich food that can be preserved for long periods. Japanese people have long been aware of this fact through experience. 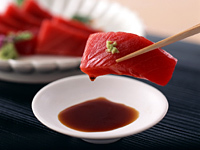 Soy sauce is an essential condiment for sashimi and other Japanese dishes. A Variety of Fermented Condiments to Choose FromJapanese cuisine cannot be made without fermented condiments. Miso and soy sauce in particular stand out as the most important among them, and both serve as all-purpose condiments. Soy sauce is used in almost all Japanese dishes, whether raw, grilled or boiled, including sashimi (sliced raw fish), sushi, boiled tofu, and teriyaki. 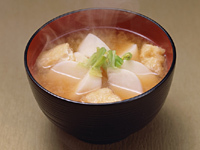 Miso is also important as an ingredient in soups, as a pickling base, and for preserving foods. Both miso and soy sauce add savoriness and flavor to food, bring out the taste of the ingredients, eliminate the smell of raw fish or meat, and effectively help digestion by regulating the stomach and intestines. They are used to season zoni, a cuisine served during the New Year holiday, with either a soy or miso flavor depending on the region in Japan. Soy sauce and miso are also typical soup flavors for ramen (noodles served in a broth). Indeed, these two condiments can be thought of as the two crown jewels of Japanese food flavoring. In addition to miso and soy sauce, another one of Japan's traditional fermented seasonings is mirin, a sweet rice wine. Made with glutinous rice, shochu liquor, and yeast, mirin is an essential condiment for cooked dishes. Having both a savory and sweet taste, it is highly useful for taking away the smell of raw ingredients, keeping the texture of ingredients firm, and providing a tasty, glossy look to the food. As such, it is used to make teriyaki sauce as well as sauce for dipping soba (buckwheat noodles). Fish sauces, also, have been produced in every region of Japan, which, surrounded by the sea in all directions, enjoys an abundance of seafood. Some locally made condiments that have become well known are shottsuru, which is made from a liquid produced by fermenting fish that has been pickled in salt, and ishiru, a sauce made of the entrails and heads of squids or sardines pickled in salt and fermented. Continuing to Preserve Traditional TastesA great deal of experience and knowledge is required to make fermented food, and fermentation methods differ depending on the type of food. The traditional flavors of soy sauce, miso, sake rice wine, and other fermented products are being preserved in Japan by masters of the art at a vast number of long-established businesses. The country is home to more than 1,500 producers of soy sauce and over 1,000 makers of miso, ranging from small local operations to large-scale corporations. Among them, Yagisawa Shoten has been operating for over 200 years at its factory in Rikuzentakata, Iwate Prefecture. Tragically, the company's building and storehouse, along with the fermenting mash for the soy sauce it was producing there, were all washed away by the tsunami triggered by the Great East Japan Earthquake that struck on March 11, 2011. 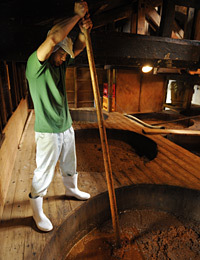 The fermenting mash, or moromi, is a mixture of koji (steamed soybeans mixed with roasted wheat and added aspergillus) and salt water, which yields soy sauce as it is fermented and aged and then pressed. The distinct lactic acid bacteria and yeast fungus that had developed over many years inside of the company's storehouse and barrels played a vital role in making its original soy sauce. Sadly, they were lost as a result of the tsunami. 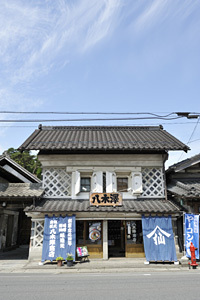 Left: Yagisawa Shoten shopfront before the 2011 earthquake. The quake and tsunami damaged and washed away the company's building and storehouse. Yagisawa Shoten faced the crisis of completely losing the traditional taste of its soy sauce. Meanwhile, however, a biotechnology-related research institute that had previously received a sample of the company's fermenting mash discovered the sample in the rubble of its own damaged facilities. Yagisawa Shoten was overjoyed to hear the news. The company is now culturing the original bacteria from this fermenting mash, and it is preparing to restart production when it finishes construction of a new factory in the autumn of 2012.